I'm an art graduate with a strong desire to create content, worlds, and stories through my art and writing. I hope the comics I make and upload to this site are worth reading. 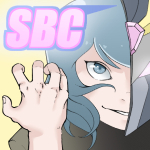 SBC is a story about Tokusatsu-style superheroes who fight monsters. It's also a story about people with issues, relationships, and other stuff that doesn't sound even remotely interesting when summarized in general terms. I can't convince you to read it with just a paragraph, I can only hope you decide to anyway, and find something worthwhile in it. I will establish a posting schedule once I've had some time to get a feel for what I'm doing.